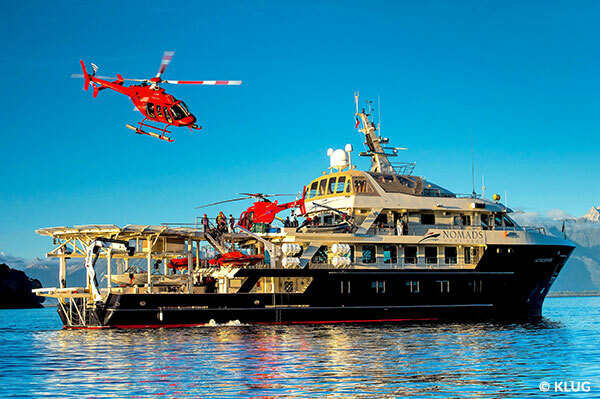 This may be the most spectacular ski trip on earth: exploring Patagonia on one of the world’s finest yachts, with two helicopters at your disposal to ski an entire region of untouched mountains. Join POWDER SOUTH on our deluxe ship, the Atmosphere, which was ranked among the top 10 exploration ships of the world by Super Yacht World and also called one of the best by Forbes. The ship has 32 crew members ready to pamper you with a spa, outdoor hot tubs, chefs, and so much more to indulge in after an unmatched day of heli-skiing. We spare no expense on this trip, from the gourmet meals to guided wildlife adventures to the open bar. It truly is a once-in-a-lifetime experience. PRIVATE HELICOPTER: 20 hours of flight time (2 groups only). 6 nights lodging (double room) at our deluxe & exclusive ship, all meals included, breakfast, lunch, dinner, appetizers, hors d’oeuvres, open bar. Onboard activities (sauna, thalassotherapy hot tubs). Wildlife adventures expeditions (guided). Jet boats, zodiacs, other watercraft and / or helicopter (according to expeditions defined by Nomads of the Seas). 1 night lodging (double room) at a 5-star hotel in Santiago or 5-star hotel in Puerto Montt breakfast included. Private Bell 407 helicopter plus second back-up helicopter. 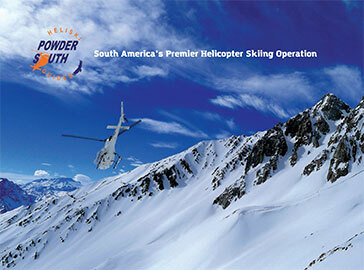 Powder Skis and/or Snowboard equipment.